The federal government is recognizing Nova Scotia's Mi'kmaw community for leading the country when it comes to Indigenous education. Twenty years ago, only 30 per cent of Nova Scotia's Mi'kmaw students were graduating from high school. Today, that number stands at 90 per cent — the highest on-reserve graduation rate in the country. The federal government recognized the province's Mi'kmaw community for leading the country on Indigenous education on Thursday by signing a new, 10-year education agreement worth $600 million. 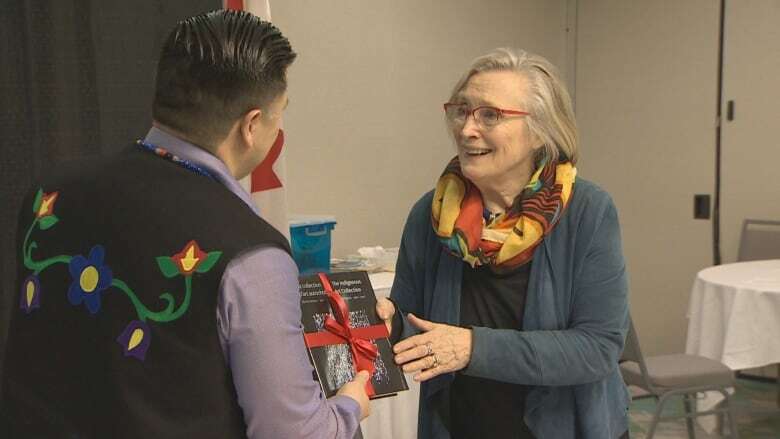 Crown-Indigenous Relations Minister Carolyn Bennett said the "amazing success" can be attributed to the 1997 creation of the Mi'kmaw education authority, known as Mi'kmaw Kina'matnewey or simply MK. "When we come together to celebrate the success of MK, we are actually setting an example for the country — and for the world," Bennett said after signing the funding agreement with 12 jubilant Mi'kmaw leaders. "After 20 years, you are demonstrating the success that everybody wants from coast to coast to coast ... The Mi'kmaw of Nova Scotia are way ahead on how important this is." Previous agreements lasted for only five years. The authority supports local band schools in delivering language immersion and other culturally relevant programs. It also protects and promotes the educational and language rights of the province's Mi'kmaw people. The high school graduation rate among First Nation students in Nova Scotia is considerably higher than the national average, which now stands at 36 per cent for students living on reserve. Chief Leroy Denny, leader of the Eskasoni First Nation in Cape Breton and chairman of the MK, recalled how he decided to become a teacher when the authority was established. As the time, none of the province's Mi'kmaw First Nations had their own schools. Students had to be bused to other communities. "It was a dream — a dream that if the Mi'kmaq could control our own education that we could reach levels never believed possible by Canadians," he told about 100 delegates to a Mi'kmaw education conference. "We know that our youth will grow into strong, proud Mi'kmaq when they are given the opportunity to learn in an environment that values the strengths of Mi'kmaw language and culture." Still, Denny said the MK has plenty of work to do. "We want a 100 per cent graduation rate," he said with a smile, adding that the focus of the authority is revitalizing the Mi'kmaw language. The Mi'kmaw Kina'matnewey reported a high school graduation rate of 89.6 per cent in the 2016-2017 school year, almost on par with the graduation rate for the entire province, which is one of the highest in Canada at 92.3 per cent. Nova Scotia's Indigenous population makes up 2.7 per cent of the provinces's total population, which now stands at around 960,000. According to federal figures, there are about 3,000 kindergarten to Grade 12 students studying on-reserve, where the attendance rate is 90.9 per cent. As well, there are about 600 Indigenous students enrolled in the province's post-secondary institutions. "This is the way forward," Bennett said. "When kids have a secure, personal, cultural identity, they end up with better health, education and economic outcomes. To be proud of who you are, means you have self-esteem, it means you have resilience."